How fast does it run when it's running? How many acceptable parts were produced? These six areas of losses impact the OEE and its three components. Breaking down the losses to these categories helps the Six Sigma team prioritize improvements. The losses affect one of the three products (A, P, or Q) and the area with the lowest percentage is likely a good place for the team to focus its improvements. The definition of "World Class" depends on several factors and the exact inputs to the calculation. World Class OEE is shown differently by many authors and companies. It is a relative value, as competition increases and expectations increase the acceptable value for "World Class" OEE is driven higher. Most importantly when improving OEE is to use a consistent and standard definition. Include your team's definition on the Data Collection Plan and the Control Plan. This applies for any metric definition for which there is varying industry accepted formulas. A company producing pencils may have an acceptable quality level of 95.00%. If your company is producing aircraft tires then 99.9999% may be a minimum world class level. Some general guidelines are shown below. What matters most is "Is OEE improving"? But like any metric it should be defined with a clear understanding of the inputs, its meaning, and the types of decisions that could result. 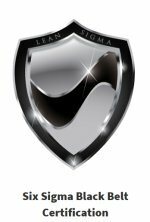 As a Six Sigma Project Manager, you need to ensure the metric will drive the best overall decisions. There isn't a single metric that explains productivity, efficiency, and scrap but this is one clever attempt. Those three buckets are large in scope and require clarity to allow an OEE value to provide fair and meaningful information. Many factors create complexity from variable speed machines, parts that can run at different rates on different machines, and "planned" scrap such as done while a machine is tuned in, warming up, or learning tolerances. With all of these factors influencing OEE in most cases (including people and parts themselves) it may be more appropriately coined as Overall Production Effectiveness. For now, OEE is explained with an example at the end. The following defines the three components along with an example later on this page. Availability is the unit of time the machine is available to run divided by the total possible available time. This metric does not include any performance numbers relative to how the machine runs while it is running. This is DIFFERENT THAN Utilization. Availability only includes the time the machine was scheduled, planned, or assigned to run. Utilization can include all hours of the day regardless of schedule. Utilization is more effective in capacity planning and analyzing the absorption of fixed costs. Availability looks at the machine itself and focuses more on variable cost absorption. Planned downtime includes lunch breaks, meetings, and any other regularly scheduled breaks that are independent of the machine. Sometimes referred to as Efficiency, is a measure of how good the machine runs while it is running (within the operating time). Pieces Produced = unplanned scrap PLUS acceptable pieces. Ideal Speed = optimal speed the part should run on the machine. Quality is a measure of the number of parts that are within specification compared to how many were produced. In some cases, there is "PLANNED" scrap production or "PROJECTED" scrap. "PLANNED" scrap is a troublesome term to use because all scrap is lost profit even if it is built into the quote and cost. If a competitor figures out how to eliminate it then you create a disadvantaged cost structure and winning new business becomes more unlikely. For example, if the machine must warm-up for a few pieces or learn a process than these pieces should not be included in the calculation. HOWEVER, this does represent opportunity. Finding a way to permanently avoid these warm-up pieces or initial scrap pieces is a credible improvement. A challenge within bulk production processes is that pieces from one operation may not be recognized as defective until later downstream. In not all cases, 100% inspection of 100% of the criteria is practical, so defects may be found downstream of the machine that actually created them. This means that actually the Quality portion of OEE for that machine would need to be recalculated with the lower value of Acceptable Pieces. As mentioned before, it is most important that everyone (stakeholders) using your OEE metric is educated on how it is calculated and what is included and excluded. This prevents challenges and unnecessary questions allowing everyone to concentrate efforts on improvements. And there will always be gray areas where it makes sense to have this or that in the formula but at some point your company or team has to define the metric. Once it is defined, spend time to educate the stakeholders and have them do a couple sample calculations to solidify its understanding. When there is significant disagreement on OEE as it is defined, it is at least good to provide a directional metric. 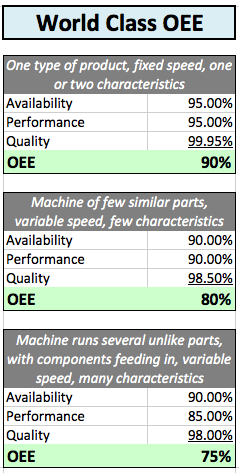 Measuring OEE consistently over time and across all machines can tell you if the machine OEE is getting better or worse even if the number is extremely high or low relative to "world class". That is more important than trying to determine if a % if good, bad, world class, etc. The question is are you getting better or worse? It can also be used to compare among similar types of machines and among all machines. An ANOVA study can be used to see if the variation is coming from within a group of machines or among them all. In summary, measure OEE consistently across the company and use it for directional purposes (rather than comparing company to company unless one is sure the measurement and calculations are exactly the same). An OEE calculator with an example is available by clicking here. Which Machine OEE is better? OEE and its straight percentages can be misleading. It is very rare that one metric can tell the entire story regardless of how encompassing its formula may seem. There is always a human element needed to check and balance the numbers. Also, be aware that you can add a lot of labor and manpower (costs!) and this will likely improve OEE. It is important to improve a metric without sub-optimizing others. Lets say there are two machines that can run a particular part and assume Availability and Quality are equal for each machine. The ideal rate in MACHINE 1 is 200 pieces/minute for that part. The ideal rate in MACHINE 2 is 250 pieces/minute for that part. MACHINE 2 is newer and equipped with better technology thus can run the same parts faster without sacrificing quality levels. Normally the part is always scheduled in MACHINE 2 because it gets the same Quality level and Availability AND it runs much faster than MACHINE 1. The typical Performance is MACHINE 2 is 225 pieces/minute when over operating time of 450 minutes (7.5hrs) thus produces 101,250 pieces. However, if MACHINE 2 is full or down for repair on that day, it is sent to MACHINE 1 to run. Through the same 450 minutes, MACHINE 1 makes a total of 87,750 pieces and this is an average of 195 pcs/minute. 195 pieces/minute is not acceptable when it normally runs at 225 pieces/minute in MACHINE 2 at the same Quality and Availability levels. This is even more important when the part is quoted at the rate of 225 pieces minute to give the company the best chance to win the job. The company knows upon quoting that this type of part should run at 225 so anything less is going to reduce the margin - assuming everything else is constant. 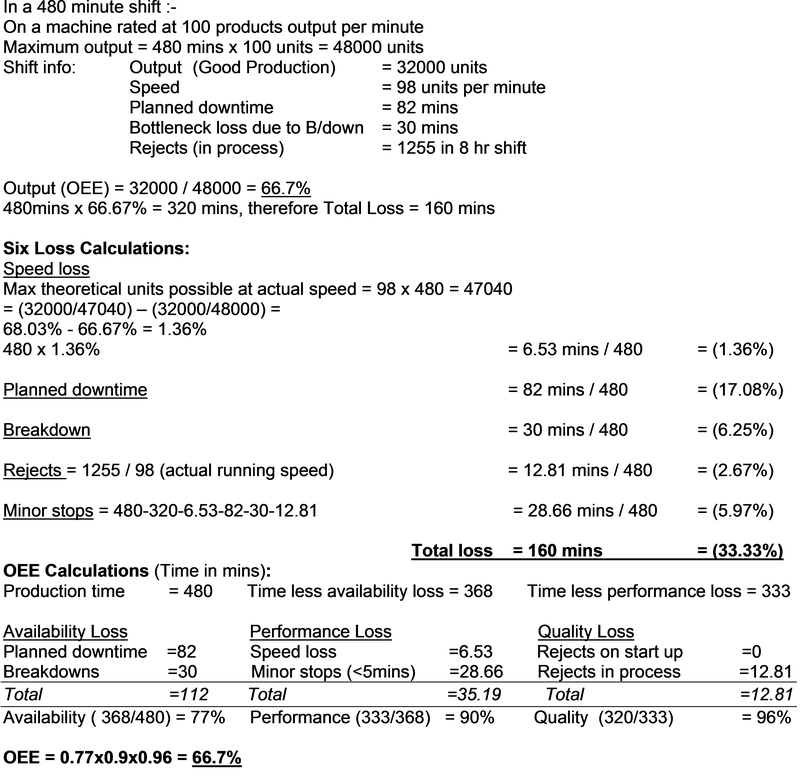 Someone may say, "use 250 pieces/minute as the ideal rate in the denominator when calculating the performance for MACHINE 1", but then this is not truly the MACHINE 1 overall equipment effectiveness. MACHINE 1 did what it was supposed to do, after all 97.5% is very good. The company should keep this part in MACHINE 2 and work to reduce the speed losses to increase the Performance level to that of MACHINE 1. In other words, if the measurement of OEE is pushed too hard, that may incline operators and supervisors to simply run the parts on a machine with a slower maximum or ideal speed. ﻿Use TPM﻿ or better capacity planning to get closer to the root cause as to why the part couldn't be produced in MACHINE 2. Those KPIV's are the inputs a team should correct, prevent, and control. Click here for more insight on OEE as is pertains to this international automotive standard as component of Section 8.5.1.5 of TPM. The figure below shows the steps and inputs to this particular OEE calculation.